Questions? 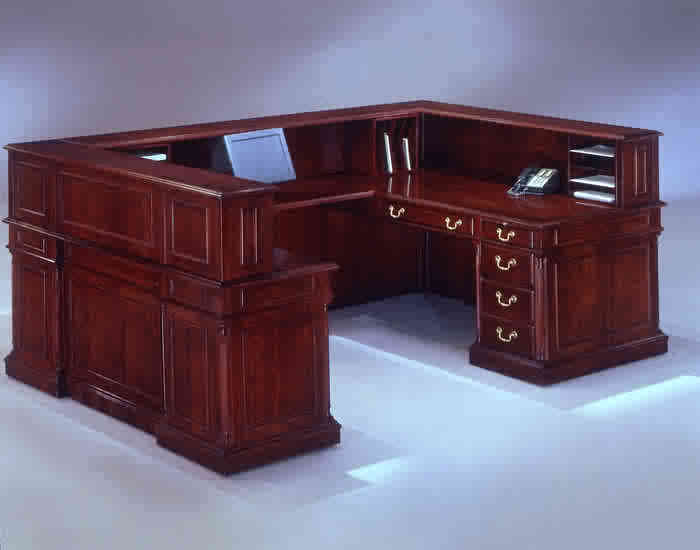 Call 856-368-9085 With its impeccable English cherry finish and refined styling, the Keswick Collection offers unmatched luxury in an office enviroment. 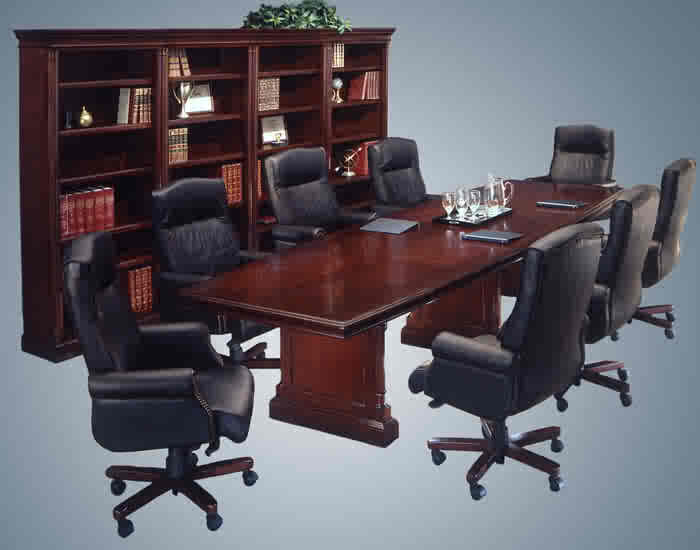 Keswick consists of an extensive line-up of office furnishings from double pedestal desks, L, U, and reception desks to credenzas, file cabinets and conference tables. 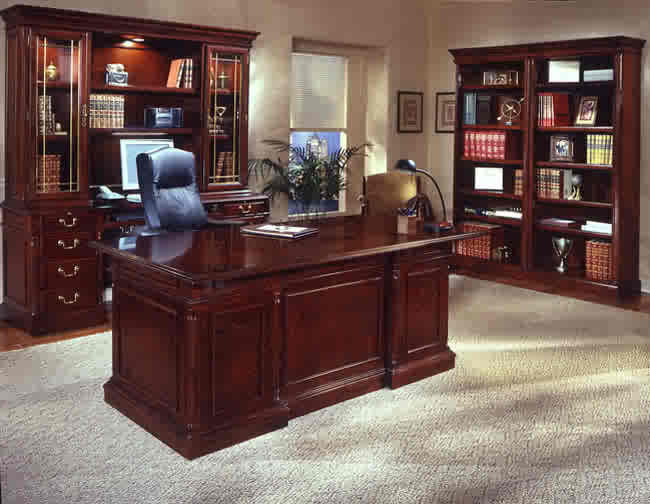 A choice of bookcases and overhead storage solutions are available to meet a variety of office demands. Features throughout the collection include fully extending drawers, locking file drawers, felt-lined center drawers, and accent and task lighting where appropriate. The collection features solid wood bases, shaped mouldings and pilasters. Tops are detailed with decorative cherry inlay veneer and walnut banding with a lustrous UV topcoat. Traditional Styling - Decorative wood accent mouldings, recessed modesty panels, and decorative, plated brass, swinging bail hardware come togeather to create a rich traditional look. Top surfaces are detailed with cherry inlay veneer and walnut banding with a lustrous UV topcoat. Construction - The Keswick Collection consists of wood, wood veneers and wood product including solid wood bases, shaped mouldings and pilasters with an English cherry finish. Tops feature a construction of wood and veneer with decorative cherry veneers bordered by a walnut banding. A lustrous UV top coat provides protection against discoloration from sunlight. Cases feature mortise and tenon construction with wood cleats, glue, screws, staples and threaded inserts with bolts. Drawers are constructed with solid wood sides and backs, veneer fronts with veneer edgebands and three-ply veneer bottoms. Drawer interiors are stained and sealed with dovetail construction. Function - All drawers are suspended on fully extending, metal, ball-bearing slides allowing easy access to the entire drawer. Box drawers have a 100lb. load bearing rating. File drawers have a 150lb. load bearing rating and are equipped with metal rods to accommodate front-to-back letter or side-to-side legal sized hanging file folders. Pull-out writing board, box/locking box/locking file drawer per pedestal. Felt lined center drawer with a double pencil tray. Three drawers, two pull-out writing boards. 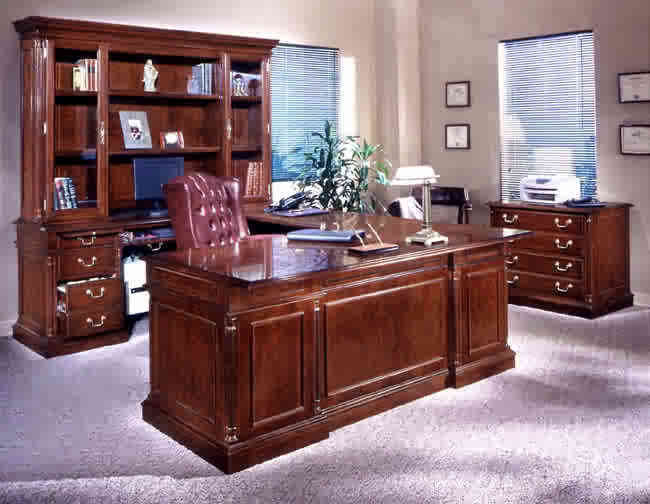 Center drawer with a drop-front; cabinet with an adjustable shelf; pull-out writing board/box/box file drawer per pedestal. Pull-out writing board, box/locking box/locking file drawer per pedestal. Drop front, pull-out keyboard drawer. Wire management access provided. Pull-out writing board, box/locking box/locking file drawer in left pedestal. Pull-out writing board, box drawer and computer cabinet in right pedestal.. cable management access provided. Drop front keyboard drawer. Four locking drawers that accommodate front-to-back letter sized and/or side-to-side legal sized files. Pull-out writing board, felt lined box with finished wood pencil tray / locking box with dividers / locking file drawer per pedestal. Felt lined center drawer with a finished wood pencil tray on the single pedestal desk. Wire management access provided on the returns. Pull-out writing board, box / locking box / locking file drawer per pedestal. 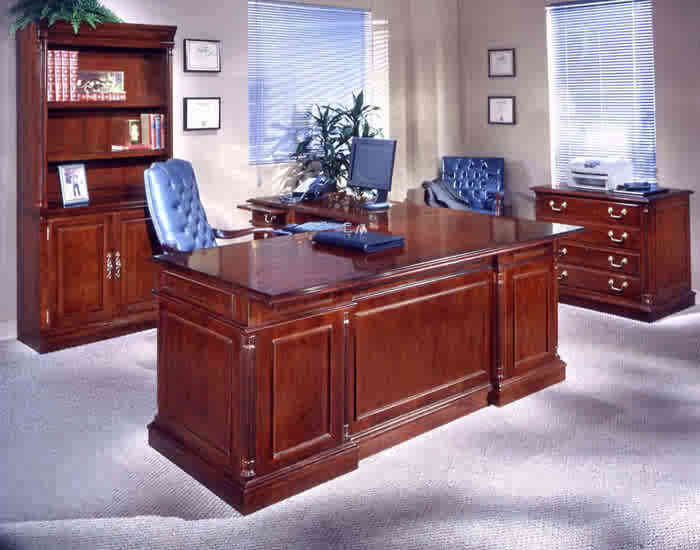 Felt lined center drawer with a double pencil tray on the single pedestal desk.Drop down pull-out keyboard tray on the credenza. Cable management access on the credenza and bridge. Pull-out writing board, felt lined box with finished wood pencil tray / locking box with dividers / locking file drawer per pedestal. Felt lined center drawer with a finished wood pencil tray on the single pedestal desk. Wire management access through center drawer of the credenza. Divided storage. For use with reception desk risers. Can use vertically or horizontally. Beveled glass doors. Two adjustable shelves on each side. Center adjustable shelf. Center fixed shelf. 20" monitor height clearance. Cable management access provided. Center fixed and adjustable ; two cabinets, each with two adjustable shelves; three accent lights; one task light. Center wood fixed and wood framed glass adjustable shelves; two cabinets, each with two adjustable shelves; three accent lights; one task light. Two locking drawers. Equipped for letter sized front-to-back and/or side-to-side hanging files or legal sized side-to-side hanging files. Equipped with an anti-tip device. Four locking drawers that accommodate front-to-back letter sized and/or side-to-side legal sized files. Equipped with an anti-tip device. Cabinet with two adjustable shelves; two locking lateral file drawers; drawers are fully extending and equipped for letter and/or legal hanging files; anti-tip device. Two door cabinet with one adjustable shelf. Top Cabinet: 42.5x21.25x36.25 compartment that is cable accessible; slide-out back panel; cable ready harness with electrical outlet; cable accessible top located shelf. Bottom Cabinet: Two adjustable shelves; cable accessible. Hanger rod; ten adjustable shelves. Removable hanger rod; five adjustable shelves, fixed shelf. Two adjustable shelfs on top; two door cabinet below.